Two recent polls by the Pew Research Center show that state and local governments are viewed more favorably than their federal counterparts. The first poll, conducted in April, showed favorability was 61% for local government, 52% for states and 33% for the federal government. Favorable views for all governments have declined over the last decade, but the decline for Washington, DC has been especially steep. In 2002 support for each level of government was clustered in the 60% range. When asked to rate states and federal government on specific characteristics the states garner more support. However, both levels of government are viewed with skepticism. Following previous public opinion polling, there is a partisan divide on which level of government is viewed more favorably. Satisfaction is related to congruence between individual partisan affiliation and the partisan composition of the level of government. Democrats had a 29% favorability rating for the federal government in the last year of the Bush Administration. With Obama in the White House Democrats currently have a 51% favorability rating for the federal government. Republican support for Washington, DC has declined from 53% to 20% over the same period. 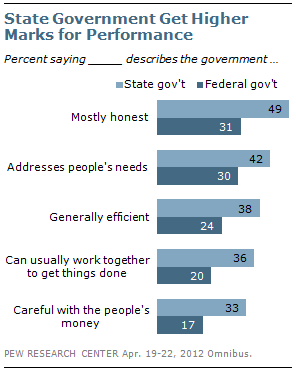 Republicans are generally more supportive of state government. However, this appears to be related to the partisan control of their state capitals. 70% of Republicans support state government when the governor and legislature are controlled by their party. Support declines to 33% when Democrats control their state government. A separate survey by the Pew Research Center (The 2012 Values Survey) shows a little more stability in people’s perception of the intergovernmental balance of power in the United States. 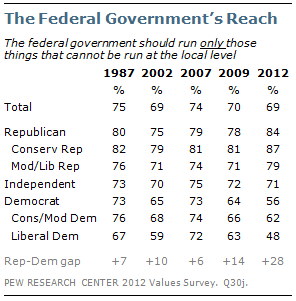 69% of Americans agree with the statement “the federal government should run only those things that cannot be run at the local level.” Republicans (especially conservative Republicans) have held remarkably steady in their support for this statement. Conversely Democratic support for decentralization appears to be more related to the President’s party. The Pew polling seems to reinforce the notion that federalism is a secondary value to the ideological predispositions of Americans. While Americans have a tendency to support decentralized government, they are also prone to vary their support for different levels of government depending on the congruence between officials in power and their own partisanship. This entry was posted in American Federalism in Action and tagged federalism, partisanship and federalism, Pew Research Center, public opinion. Bookmark the permalink.